I did it! It’s quite amazing actually. I am so not a recipe maker. A recipe modifier perhaps. And an awesome recipe tester. But holy cow it is a major feat for me to actually create a recipe. And that I did! I have been trying to find a grain free, GAPS legal graham cracker recipe that is S’more worthy for over 2 years. I have done a lot of searching, and baking, and testing, and finally decided to get daring. In preparation for our last camping trip I spent one entire day fiddling around and finally came up with these. They are grain free, GAPS legal, egg free, and you are going to want to pin them for later. OH, YEAH! This recipe is most easily made in a food processor, but you can certainly use a pastry cutter and some old fashioned arm muscle. In food processor or large bowl, mix well the coconut flour, almond flour, gelatin, baking soda, salt and cinnamon. Cut in (or pulse in if using food processor) butter until mix is moist and butter is blended in. Mix in honey, water, and vanilla. At this point you want the dough to become a traditional doughy ball. If it is too moist, then slowly add small amounts of coconut flour until you get a dough ball that is not too sticky. Not too much or it will be too dry to roll out. Line a cookie sheet with parchment paper and transfer the dough ball to the middle. 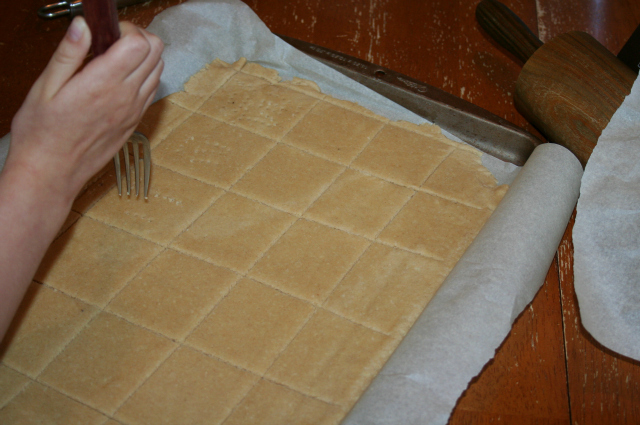 Cover with another sheet of parchment paper, and roll! This takes some practice, but you want to roll it to be about 1/8-1/4 inch thick and to fill up as much of the pan as possible. The closer to 1/8 inch thick, the better. 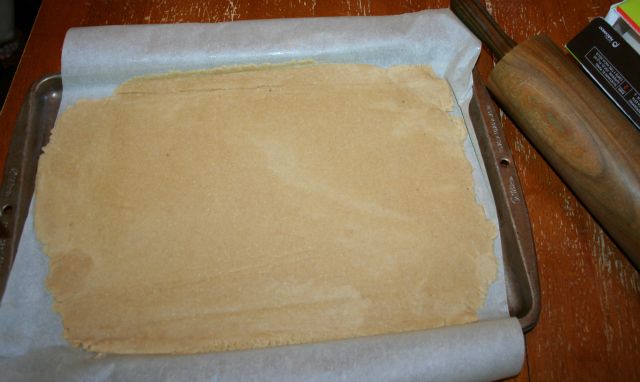 Remove top parchment paper and use a rolling pizza cutter or a knife to cut it into 2 inch squares. You can get fancy and use a fork to prick tiny holes in the top of the dough. Bake for about 20 minutes, until the dough begins to get brown on the edges and top. Remove from oven and let cool completely. At this stage the crackers will still be soft. Try to resist eating them all! Once cool, turn oven back on to 200 degrees. Return pan to the oven for approximately 3 hours, or until crackers are golden all over and mostly dry. This is the part that makes them crunchy and S’More worthy! The longer you leave them, the harder and crunchier they will get. 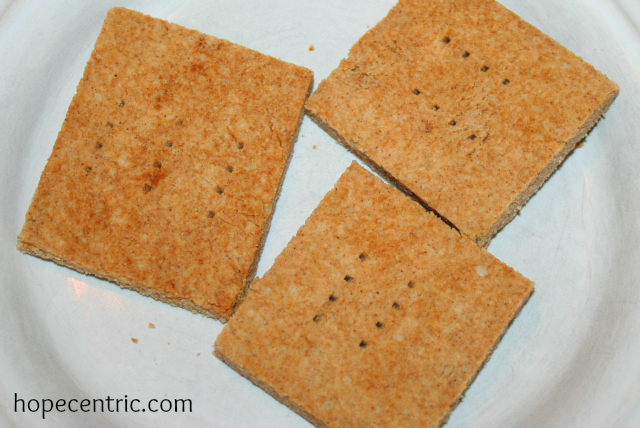 Remove from oven, cool, and break apart into individual crackers. 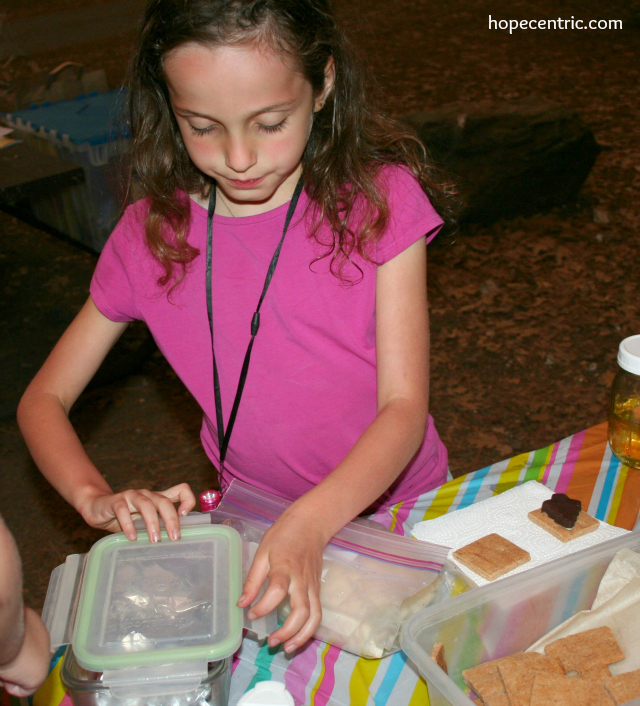 Store in air tight container, saving the cute square ones for your S’mores adventures. Snack on the crunchy edge pieces, or use as a yummy yogurt topping. note: I have not (yet) made this recipe using an alternative for butter. Tallow, coconut oil, and avocado oil would all be options I might try. If you do make them dairy free, please let me know how they turn out! Do you have a traditional camping treat? Tell me about it in the comments! How about the marshmallow recipe with this to make smore’s? I keep looking for the source of my marshmallow recipe online and can’t find it. Guess I will have to post that, too! Looking forward to trying your graham crackers! Thats the one! I forgot I had it pinned. I use this recipe 🙂 Thanks! This is fantastic! I’ve been looking for a home made graham cracker recipe,and I use coconut and almond flours almost exclusively already. Thank you! If we can’t have honey, what could I sub? I use Stevia and Truvia but I’m sure the honey adds liquid/binder that those wouldn’t. Any ideas? Hi Cathy. I wouldn’t recommend using a commercial stevia or truvia, which are both processed sugars. If you are using a pure stevia powder or granulated type sugar like rapadura, I think I would try dissolving it in 5 tbsp water before adding it in. Though I think if raw honey was not an option I would first try molasses, which would give a similar result to using a really dark honey. Hope that helps! If you change it up, please let me know how it turns out! You can also make a past from dates and thin it with water to the same consistency as honey. Dates make great a great sweetener in baking. I am going to try this too. I’m going to do both! This may be a silly question, but is the gelatin supposed to be dissolved first or put on dry? I can’t wait to try these! Thanks. Do you think if I used ground sunflower seeds in place of the almond flour it would work? I can’t have nuts. This recipe looks so good! I’m going to try putting my graham crackers in my dehydrator instead of back in the oven. A cooler solution on a hot day. We’ll see how that works! Great idea! My dehydrator seems to always be full of yogurt so I stick them in the oven. 🙂 How did it go? Hi! The ingredients say baking soda and the directions say powder, can you please clarify before I attempt these? Thanks so much! Soda! Not powder. Goodness I have not even had that in my pantry for more than two years. Thanks for catching that! I made a different recipe with different proportions. I never tried it with the almonds, but, instead, substituted sunflower flour for the almonds so my little one could take it as her snack. There are lots of other kids with severe nut allergies that require I substitute it out on those occasions. Also, since honey may make a softer cracker, I put it in the dehydrator after baking them. They were nice and crispy :). I’m not Virginia so I can’t say, but they should sub 1:1 Melanie. Can ground pumpkinseeds be used instead of the almond flour, and to the same ratio? Just made your recipe with coconut oil instead of butter, as my daughter is dairy free, and unfortunately, at 350 F for 20 min, the crackers burnt. 🙁 As you can imagine, we did not put them in a 200 F oven for three hours after cooling, because they were already pretty crispy. 😉 So, I think with coconut oil, a lower temperature is a must. I will say, the least burnt of the crackers definitely hint at the potential of this recipe and I will definitely try again at a lower temperature (and check them continuously, too!). Thank you for the recipe. I just made these today. My almost 10 year old goes to a day camp, but they have a few special overnight camp outs during the sessions where the other kids will get to have s’mores. We have been on GAPS for nearly 3 years now and I was hoping I could find something alternative for the graham cracker. We are still dairy free though and it worked fine for us using coconut oil. For the commenter who said that the crackers burned for them, it is possible that the crackers were rolled out too thin to start. I still can’t eat coconut flour, although my daughter doesn’t seem to have problems with it. But I still could not resist a taste. And then another, and another. I will be paying for THAT over the next few days. But it is worth it to know that my daughter will have a tasty treat that she will be super happy with. Thanks for the recipe! These are ABSOLUTELY the best gluten free graham crackers we’ve ever made– and to think they are also grain free AND harder yet, egg free!!! (Both recently discovered needs in my house.) My kids and I are thrilled! Thank you so much! Thank you Melissa! I’m so glad they are helping out in your home.